anywho ... back to business. even though i've lived in chicago / chicagoland my entire life, i had never been to any of the francesca's restaurants ... surprising, right? i don't know why ... i just hadn't! so we decided to head over to our local joint : mia francesca on clark in lakeview, the first & original. about this group : "when chef scott harris opened the doors to mia francesca on north clark street in 1992, he created a trend in the chicago restaurant scene that has become a benchmark for urban dining." true. like i said, what was i waiting for? 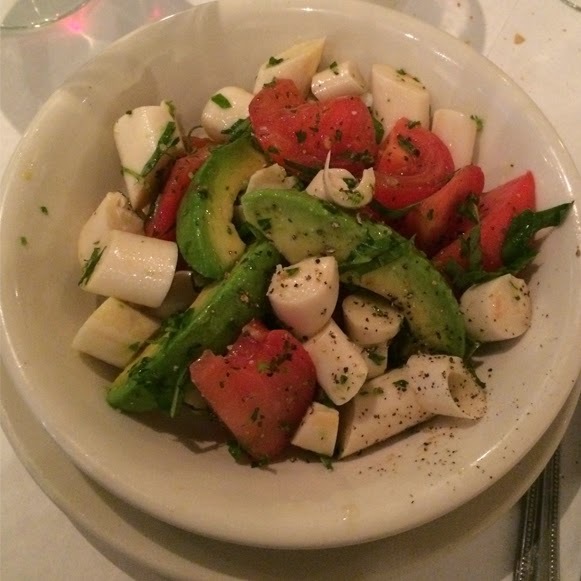 hearts of palm, avocado & tomato. simple & delicious. something i will definitely be replicating at home... easy enough, right? kind of a perfect lunch salad. farfalle w/ peppers, eggplant, broccoli & zucchini. a nice mix of veggies ... but the actual pasta was kind of meh, sadly. also, sometimes i forget i don't love eggplant & then it ends up on my plate & i'm sad. with so many francesca's options around town, i don't see how it's possible that i don't head back at some point. classic chicago italian fare. enjoy!